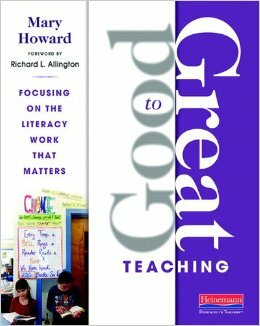 Each week, the #G2Great Twitter chat based on Dr. Mary Howard’s book Good to Great Teaching: Focusing on the Literacy Work that Matters is hosted on Thursday evenings. The chat is usually a lively and inspiring discussion with great educators. We are very fortunate and proud to have Dr. Mary Howard share her insight with us in this week’s 5 Questions with… feature. 1. What do you most want your students to take with them from your classroom, school or district? Above all, I want every child to receive the gift of joyful literacy – or to acknowledge first-hand that reading and writing is a worthy pursuit both in school AND at home. Unless we can inspire students to lead readerly lives within and beyond our doors, their view of literacy will be forever clouded and we cheat them out of reading and writing as an enthusiastic lifelong endeavor. Within that culture of joyful literacy, we then offer a multitude of opportunities with wonderful books at the center that will spark their curiosity for learning and ensure successful ventures to instill in students and teachers the belief that every child has unlimited learning potential. These inseparably intertwined goals will have the lifelong impact our students need and deserve. 2. What are the most rewarding and/or the most frustrating aspects of education? Frustrations surely abound in education these days and yet most of the craziness looming in the distance, while frustrating, is out of my control and therefore does not warrant the professional energy that is needed for more important things. Our energies are best focused on those things we CAN control, or how we will accomplish the ultimate goal of student learning so we take our instructional choices seriously. For me, the most rewarding aspect of teaching are magical moments when we look into a child’s eyes and can say with absolute resolve that all that we chose to do in that learning moment has the potential to lead to the success of that child. What students need from me is ME – not politicians, test makers, naysayers or publishers with questionable materials who blur my view – ME. It is always my choice to refuse to allow those things to impede my efforts toward my goal of student learning. It is always what I choose to do when those hopeful faces are looking back at me. It is always those things in my control that have the greatest impact on student learning. And it is always in my control to choose to place my time and energy on those things. 3. What advice would you give to young teachers? Be resolved! Be brave! Stand up for student learning. Stand up for what you value. Be sure you value the right things. Don’t be afraid to make mistakes and learn from them. Choose your mentors carefully and surround yourself with dedicated others. Don’t waste time on people or things that sap your commitment to do your best work for students. Our young teachers are the future of education so we must nurture and support them in those early years when they need us most. Never forget the many challenges that come with being a new teacher and respect that we went through those challenges in calmer times. Support their efforts as they maneuver the professional path to excellence and help them recognize and refute bad advice. We owe it to our young teachers and we owe it to the students whose lives they will touch now and in the future. 4. What has influenced your career the most? I have been fortunate to have many life-changing influences over the past four decades of my career – brilliant thinkers like Marie Clay, Richard Allington, Donald Graves and too many others to mention. But by far my greatest influencers have been students and teachers who have taught me what good teaching looks, feels like and sounds like in the glorious heat of the learning moment. I have surrounded myself with teachers who believe as I do in the tremendous potential of every child and our shared belief that there are no acceptable losses. All I know, believe, do and strive to achieve now as well as in the future is grounded in my work with children and teachers. My professional goals have always been and will always be because of and for the remarkable students and dedicated educators who have inspired me and supported my thinking over the years. Even after all of these years, I wake up every morning bursting with joyful enthusiasm for the new learning that awaits me. How can we inspire students to new learning if we aren’t willing to walk the same path? I don’t believe we can! 5. As an educator, what are you currently focused on? Quite simply, my singular goal is to learn something new every day in any and every way possible. Twitter. Books. Articles. Seminars. Conferences. Webinars. Lessons I observe and teach and the dialogue I have about those lessons with others. These things and especially the meaningful conversations grounded in the learning process with students and teachers are the basis of my current goals. Often my most important learning happens when I least expect it, in the quiet moments where my own ponderings take me on wonderful twists and turns that move me to consider incredible possibilities I didn’t notice before. I have the great fortune to work with many amazing teachers across the country who kindly share their thinking and their students with me. They are collectively my most important teachers. We must never stop learning in the name of our students. We must believe from the core of our being that every child has unlimited potential. We must acknowledge that students depend on US to rise to the occasion each and every day. We must remain committed to making each precious moment in every day count and to value every tick of the learning clock. Both teachers and students inspire me to be a better teacher tomorrow and the day after that and each day that follows. I CHOOSE to learn every day. The best teachers I know CHOOSE to learn every day. Our choices matter! We matter! Most of all the students who are the recipients of our choices matter! Everything I do is ultimately focused on how we can be a force of good in our schools because our students – all of our students – have always been and will always be what matters most! And making that our priority, my friends, is always a choice! Mary Howard, Ed.D. is a national literacy consultant and author of three Heinemann books including Good to Great Teaching: Focusing on the Literacy Work that Matters (2012), RTI from All Sides: What Every Teacher Needs to Know (2009), and Moving Forward with RTI: Reading and Writing Activities for Every Instructional Setting (2010). Mary presents at conferences, schools and districts across the country and continues to work with student and teachers in school settings as a reading coach. Thank you for the honor of responding to these inspired questions, Rich! Answering the questions simply reminded me how very much I love teaching and admire and respect the many teachers who are doing the work that matters in their classrooms day after day. I am constantly inspired by their unwavering dedication as they go about doing the very best work in the name of their students. Thank you so much for supporting our wonderful teachers as a leader in the field!